Arbeit Macht Frei. Work sets you free. That was on the metal gate entrance to the Dachau Concentration Camp in Dachau, Germany. The gate that separated the innocent outside world from the atrocities that occurred inside. I experienced first-hand the aftermath of those atrocities, the site we all must visit, to make sure the Holocaust does not happen again. Getting off the bus at the Dachau Concentration Camp site was an experience that I have never had before. Everyone walked in a slow, controlled pace and voice volume was somber. The first stop on the camp tour was the museum portion; a place that was built by the prisoners to be used as a maintenance building. Inside was room after room of posters and artifacts that depicted the rise of the Nazi Party, the daily life of the prisoners, life at Dachau and everything a person would need to know about the horror of the place. Trying to picture myself as a teenage girl in that situation, the situation where every day, I would line up, stripped of my identity and treated as a prisoner for doing absolutely nothing and people would decide if I lived or died. The roll call square was massive. Every day, multiple times a day, prisoners would have to be lined up to hear their fate for the day. The original barracks were destroyed after the war, but the ones that were rebuilt as a model were just as horrifying. Bunks on top of bunks made only of wood and in bunkers that housed hundreds of prisoners, when in theory they were not designed to have more than fifty. The toilets and sinks were in inhumane conditions with no privacy and with just a mere few to cover the hundreds of prisoners that lived in the barracks. Thinking of the incredibly inhumane conditions Jews, gypsies, homosexuals, Jehovah’s Witnesses and others amongst selected groups had to ensure was mind boggling. In a place that seemed so empty, there was history and stories. Every single rock that was on the ground was a reminder of the suffering that occurred there. The dirt that made its way to the bottom of my black sneakers was the same dirt that people stood on when they had to fight for their lives. Walking through the camp, I came up to the area where the barracks previously have been. I was disgusted at the magnitude of it. Each plot of land had been memorialized with a number, and for every number placed on the ground, it was representative of the thousands of prisoners resided in that location that never made it out those wrought-iron gates. Poplar trees lined the wide dirt road where the barracks were located. Those poplar trees were the only signs of life at the camp, a source of greenery where the sun would shine through in a place that was so desolate. 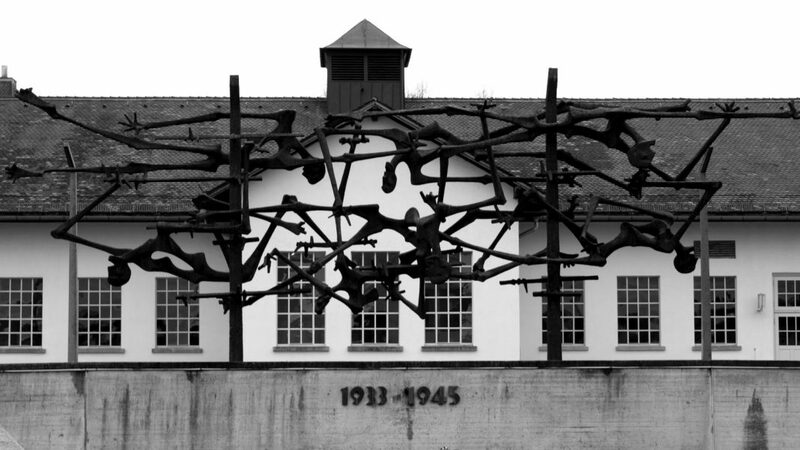 The pictures and stories I had in my head were not even close to how brutal the prisoners were treated at Dachau. It was the “guinea pig” of concentration camps. The first ever camp built that would serve as a prototype for all of the other labor camps. How does one even feel, knowing they are in such a sacred memorial site for an event that was so tragic and took the lives of so so many innocent individuals. Walking even further back in the camp, tucked strategically away in a corner was the crematorium. Gruesome and horrific could only begin to describe combination of all the emotions of seeing those brick ovens that murdered and cremated millions of innocent people. People who were murdered because of who they identified with were consequences in the cruelest form of humankind. People who stood next to me were in tears, I felt as if all my tears were stripped away. I felt nothingness. I felt so devoid of any emotion that it wasn’t until later that night that the anger hit me. What does it mean to be Jewish? What does it mean to visit a concentration camp? What does it mean to even walk on these sacred grounds? The only decent conclusion I have been able to come up with since my visit almost a month ago was that if Jews do not come to remember and memorialize the innocent people that were just following their hearts and their religion. Their spirits and stories deserve to be kept alive. Being Jewish, this experience meant more to me than any religion event I have ever participated in. It was a chance to experience first- hand what my ancestors before me faced because they did not live in a time where Judaism was so widely accepted. 74 years after my ancestors faced the horrors that the Nazi’s placed on them (after Dachau was liberated in 1945), I was in the exact same place to bear witness to the events that happened before my generation. 74 years later, I walked out of those same gates, “Arbeit Macht Frei,” that so many of my ancestors never got the chance to do.